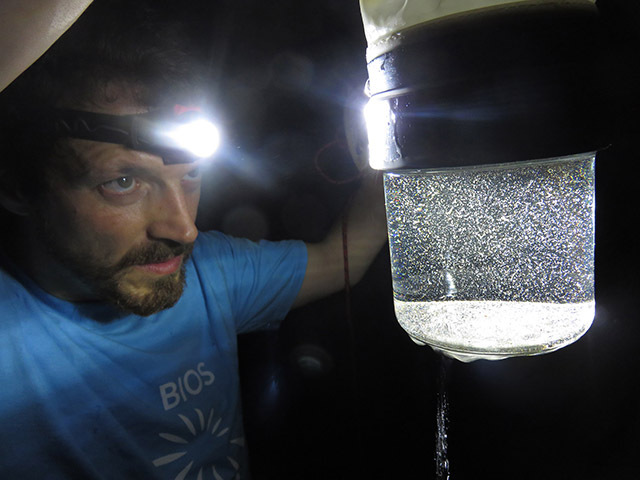 The cool darkness of the cave provided relief from Bermuda’s spring sun when BIOS scientist Leocadio Blanco-Bercial ducked down and slipped inside, eager to explore the quiet habitat of organisms smaller than sand grains. His cave research, which began in early April, teamed him with researchers from the German Centre for Marine Biodiversity Research to gather water samples from six of Bermuda’s renowned—yet mysterious—limestone caves. By Blanco-Bercial’s estimates, hundreds of tiny creatures inhabiting water that pools in the island’s caves have yet to be fully understood, or even identified. Of the many types of organisms studied by biologists, Blanco-Bercial is interested specifically in miniscule aquatic crustaceans called copepods. Many of the island’s 200 identified caves, with names like Wonderland, Deep Blue, Fantasy, and Devil’s Hole, are tourist attractions or serve thrill-seeking recreational cave divers. Blanco-Bercial looks at their dark, wet interiors through the eyes of a molecular geneticist and sees another—scientific—potential. “We have very little information about who lives in that water, and what they are doing there, and that is exciting to me,” he said on a late April visit to several caves in Hamilton Parish, a short distance from the BIOS campus. He’s not only after their names and activities. A population geneticist, Blanco-Bercial seeks to answer larger questions about how copepods—critical to the marine food web—are dispersed throughout the globe and how they have evolved over millions of years. Blanco-Bercial said he’s driven by curiosity to identify the tiniest of cave dwellers. “We have some interesting questions to ask about their genetics,” he said. “We need to figure out who their ancestors are and how these organisms are related to each other and to their relatives worldwide.” Bermuda’s long separation from other landforms means that species found there are likely unique to the island, he said. Researchers at other seemingly desolate cave systems have found that caves can actually host a surprisingly diverse array of organisms that survive underground despite the extreme dearth of light and nutrients. In 2013, a team of researchers led by scientists at the University of Arizona in Tucson discovered communities of microorganisms living in the limestone caves of Kartchner Caverns State Park. These microbial ecosystems thrive by teasing out the limited nutrients in water runoff that drips into the cave through cracks in the cave's rocky exterior, the researchers said. These types of unexpected discoveries help scientists understand how organisms live in extreme environments. To his knowledge, there are no existing samples of Bermudian cave-dwelling copepods suitable for molecular analyses. That meant that Blanco-Bercial, who is 38 and has thus far spent his career on the decks of deep-sea or coastal research vessels offshore Atlantic and Pacific coasts collecting and identifying minute marine organisms, needed a team of individuals who could don headlamps and beat-up sneakers (and at times, snorkeling and even scuba gear) during their initial weeklong cave forays. Two years into his faculty appointment at BIOS, Blanco-Bercial said he’s grateful for a chance to contribute to the understanding of the island’s natural history. “There is the possibility of new species to be described, or new locations added for the existing species, adding to the general knowledge of the ecology of the caves,” he said. Bermuda’s caves—protected by the government’s Department of Environment and Natural Resources—vary in size, from the large, winding, and heavily-visited Crystal Caves, to the more typical narrow, hidden, and muddy-floored caves, tucked into leafy hillsides or along quiet beaches. That’s where Blanco-Bercial and his team chose to gather samples during a week in early April as they began laying the groundwork of what they hope will be a larger and more elaborate, funded project. Some water samples were easily collected using hand nets or tow nets. Deeper water samples required the expertise of Bermudian cave diver Bruce Williams, who donned a scuba tank and underwater lights to capture samples over six long days in the field. Once collected, Blanco-Bercial and his colleagues returned to the BIOS lab where, to aid in their preservation, the samples are kept in the lab at room temperature, very similar to the water temperatures at the caves. Enlarged photos of copepods captured from other caves worldwide reveal extraordinary, otherworldly creatures with teardrop-shaped bodies, rounded or beaked heads, and antennae. Analyses, photography, and identification of the Bermudian samples (including identification of specific gene markers) have begun; Blanco-Bercial said he was particularly excited by the find of three organisms that may represent new species. Once all the samples are completely analyzed, Blanco-Bercial said they will have a better idea of the species at each location, and can accordingly plan future research.